Wether you practice ancient Magick, rever the egyptian Goddess Bast or Bastet, or just want to know about cats, this site will help you. Read about black, white, orange and calico cats, of witches, feline mummies and the history of cats mummy. 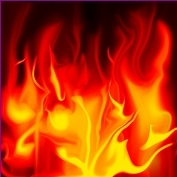 What pagans and paganism has to do with folk lore, tales, rumours, the sun god ra. See figurines from cat in Buddha pose lotus seat, read news about pets and cats. See the signs of aloe vera and a natural life. Be a feline friend and friend to felines, see their healing nature. The connection between humans and cats dates back nearly 10,000 years. Various rumours and stories have evolved around the reason why this relationship was formed. It certainly must have been beneficial for both sides in order to last this long. The first sign of some sort of companionship between a human and a cat can be dated back over 9,500 years ago. On Cyprus, a grave was excavated in 2004 that contained skeletons of both human and feline origin, and they were close to each other. Next we meet the cat in the ancient Egyptian culture. 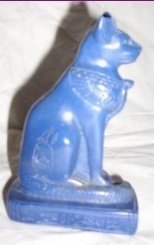 Many statues of the Goddess BAST or BASTET are conserved from this time. Bast is usually depicted in her shape as a sitting cat, sleek and alert. The Goddess Bast was revered as the protector of the home and the fields, especially from vermin infestation. In Egyptian mythology she is the daughter of the Sun God Ra. But true to a cat's nature, Bast also had a ferocious side. Sometimes she is portrayed as a woman with a lioness' head. A true mother fiercely protecting her young. The ancient Egyptians loved and revered cats. This went so far as to mummify their bodies after death. Uncountable cat mummies have been found in excavated graves in Egypt. The medieval times were the darkest chapter in cat history. Stigmatised to be evil, in league with the devil and demons, they were said to bring bad luck and especially black cats were often caught in baskets and burnt like witches at the stake. It was considered blasphemy to have any kind of caring or loving relationship with a cat. Especially a black one! Little wonder that women, who cared for the mistreated and persecuted creatures, were considered witches and their "devilish" feline companions the connexion with the evil powers. Thankfully this horrid time span ended together with the witch hunts, and once more the cat was in favour with mankind. And yet again her attributes were considered as magical, she was said to have healing powers, and somehow this little hint of mysticism never left the feline species. And is it not remarkable that women seem to have a much stronger bond with cats than men most of the time? And do we not think of wise women, of herb lore, of magical and enchanted hours when we see a woman and a cat together? Modern times have given us a tiny glimpse of what "Magic" a cat can do. Science has proven that to stroke a cat and hear and feel it's purring relaxes people and reduces stress. Modern medicine confirms that to have a cat laying close to or on a limb that pains with arthritis or rheumatism has a calming and pain reducing effect. And have we not all at one time or another looked into a cat's eyes and wondered what mystique and magic lay behind their all-knowing and all-understanding glance they give us? I often heard it said that humans can be divided into three categories, "cat lovers", "cat haters", and "others". I find it interesting that seemingly "cat lovers" somehow recognise each other without many words. Maybe the communication between themselves and their cats has them so finely tuned in their (dare I say psychic?) powers that a likeminded soul is also easily recognised? With Neo-Paganism and old beliefs growing stronger these days, so the cat once again takes her rightful place besides her human companion, modern witches once more call the cat lovingly their "familiars". Although in most cases the cat does not fulfil her role as protector of the home from vermin infestation these days, surely she keeps many a human from loneliness and her gentle and comforting nature heals many a psychic wound. Cats have a very fine sense for moods of their companions, and contrary to the belief that cats are loners, they search for and enjoy closeness. Cats have personalities, just as varied as their human counterparts. Some cats are more drawn to their own kind, others prefer the company of humans. Most of them, however, like "mixed company" and adapt well to any group of beings. They have adapted so well that they easily live indoors without ever going out. But this requires an active companion, be it another feline or a human that spends time with them and plays along. Distraction is necessary, such as a window sill to sit on and watch the world go by (also known as "cat television"), or a secured balcony to catch a fresh breath of air and chew on a bit of special cat grass grown in a flower pot. It is a sad myth that claims cats lay on baby's faces and smother them. It is completely unnecessary to give a cat away just because a baby is on the way. Cats easily adapt to a new family member (of whatever species) and willingly include it into their "pride". Another unfounded myth is that cats should have a litter of kittens before they get castrated. This is a complete waste of lives (especially when the kittens don't have a good home to go to and get killed!) and there is no medical necessity. 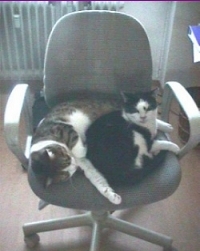 Any cat, male or female, should be castrated as soon as possible. Female cats go into their first fertile cycle between the age of 6 and 9 months, depending on their time of birth. Cats born in autumn tend to go in heat in the following spring, so as early an age as 5 or 6 months. In order to avoid the (very!) audible distress of the female cat indoors and her "suitors" outside, the responsible human companion should visit the veterinary as quickly as possible to have the cat castrated. Male cats should also be castrated around the age of 6 months. Thereby the urge to "mark" their territory can be completely prevented. It can be very uncomfortable to have a male cat living indoors that needs to "mark" every corner. Even "blunt" human noses will be easily offended by that stench! The decision to become a cat person is not to be taken lightly! Cats, under normal and healthy conditions, live many years. A normal life span of an indoor cat is around 12 to 14 years. However, some cats have been known to become over 24 years old. Therefore it is a long-term relationship and separation is, as with any relationship, painful. So think at least nine times before making a decision on adopting a cat. For each life of the cat think carefully if you can fulfil this commitment for a long time! Tricoloured cat, also called "calico", considered to be "lucky cats" indicating good fortune. We certainly considered ourselves lucky to share our lives with her for 11 years. 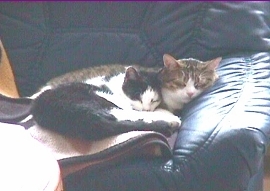 "Fleckchen" was born in May 1992, "cat-napped" by us in October 1993 and after 11 years her weak kidneys gave out. 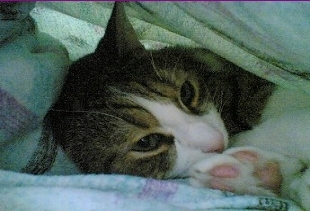 She passed away in my arms on 27 December 2004 shortly past 4 p.m.
A gentler and more affectionate cat I have never encountered. 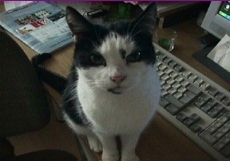 We picked him up from the animal shelter in Wiesbaden, 2 days after our beloved Mister Moll passed away, in September 2003. Morty, as he is known, is definitely madly in love with Shannon. And even though he is twice her size, she still makes sure he knows just "who's boss!" He was very much afraid of people when we picked him up, but in the meantime has learned to trust and comes up for cuddles quite regularly. Morty is a typical "cave cat". He loves to crawl underneath blankets and curl up in a little warm burrow. A special place on the balcony, protected with a cat net, is the perfect place to watch the birds, the people and the world in general. A flower pot with special cat grass makes it a favourite spot for both. 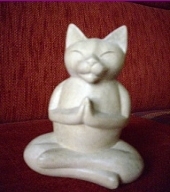 Wooden cat figurine in "Buddha Pose" lotus posture. Aloe Vera - It's a Natural Life Was ist heute los?